Hello Helmar Fans! JJ here again, continuing our week of partnering with Want2Scrap. 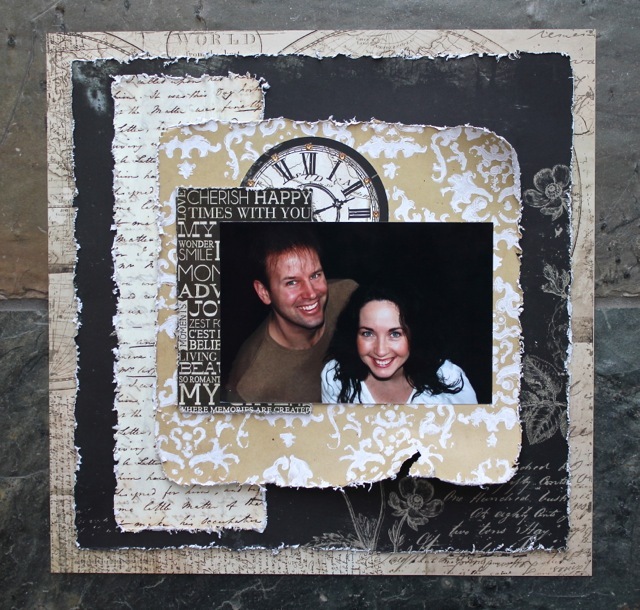 I got to work with some awesome chipboard shapes, and decided to showcase them in a scrapbook layout. I started off with layering my page with papers and my photo, using Professional Acid Free glue - my first choice when scrapbooking lots of papers. Then I prepared the chipboard pieces. I painted, and embossed them, then added a second colour of paint to give them a bit of a 'patina'. Next, I layered and adhered the chipboard with 450 Quick Dry. This is something that I never would have tried with the adhesives I used to use - gluing something to an embossed surface is tricky. 450 Quick Dry just took it in stride, no questions asked! I LOVE journals! 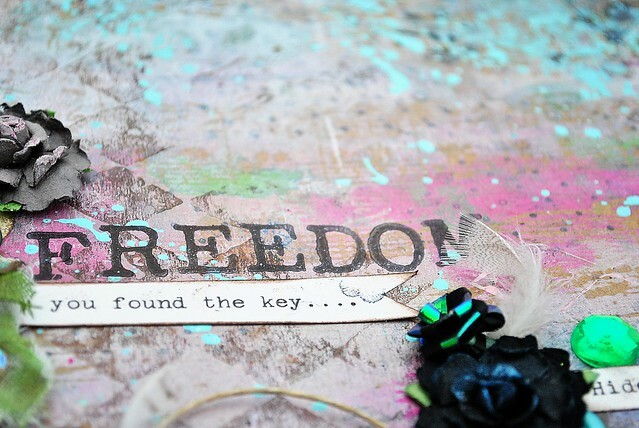 I love any kind of journal..... vintage, new, big, small, store bought, home made. Journals are just so much fun! 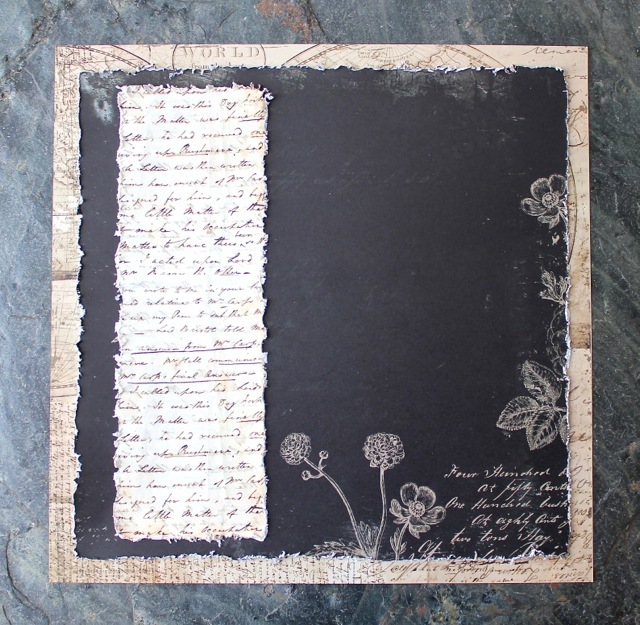 So when I saw Want2Scrap's Sprightly Sprocket Chipboard Album by Donna Salazar, I knew I had to make it into a homemade journal. There is something about creating a journal that is so calming. It just makes me happy! I also used some of my Susan K. Weckesser Inc. products, such as my 'Painted Sentiments' Unity Stamp Co. Stamps and my Live in Color paper that can be found at Want2Scrap. After painting the chipboard I used Helmar 450 Quick Dry Adhesive for EVERYTHING!! I love this glue because it works so fast. 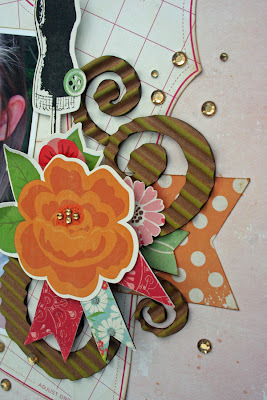 It even worked on the metal embellishments that I used from Prima Marketing. The only different Helmar product that I used on this project was for the my word 'HOPE' and then I used some of Helmars ZAPDOTS because I wanted it to pop. 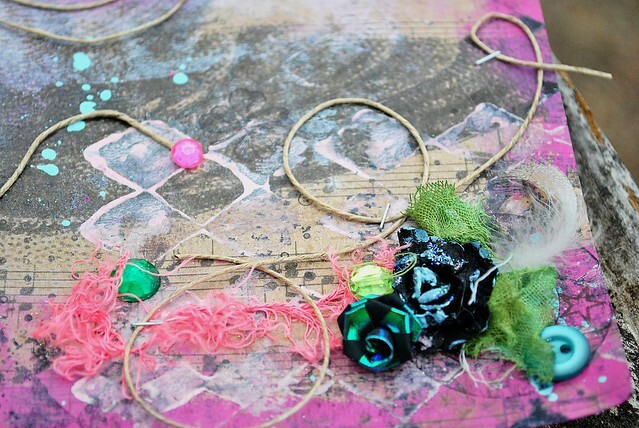 I also had a LOT of fun playing with some of Want2Scraps BLING! You can never have enough BLING!!! Now I have a cute new journal to write and doodle in! Have a super AWESOME & creative day! Upcycling is all the rage these days for many reasons, it brings a whole new meaning to "One man's trash is another man's treasure." You can save money on supplies and decor. Help the landfill issues and reduce you carbon footprint. 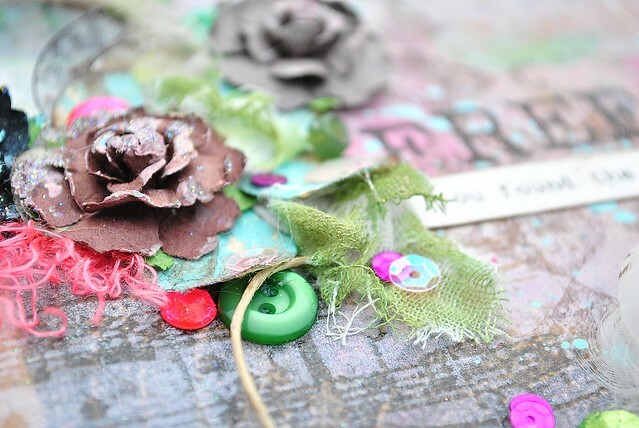 No matter what your reason to reduce, recycle or reuse if you are going to make something beautiful from junk then you need to have the proper adhesives. Check out these center pieces I created from wine bottles for a local fundraiser event. Here is how I got the suspended feathers in the glass bottles. Take a large disposable straw, place it on the end of the Helmar Liquid Scrap Dots tube. Squeeze 1/4 inch of the Helmar Liquid Scrap Dots into the straw. Place the same end of the straw into the neck of the wine bottle. Blow out through the straw to remove the Helmar Liquid Scrap Dots from the straw into the neck of the bottle. Make sure your straw is at a slight angle so you get the adhesive on the inside glass of the neck. Play with the placement of the quill in the neck of the bottle to make sure the Helmar Liquid Scrap Dots has securely grasped the quill and the glass. Let dry 24 hrs then cut off quill as far down into the neck as you can without disturbing the adhesive. Repeat with the spear feather coming out of neck as seen in the first image of this post. The next grouping for a center piece I did was to combine white flowers and $1 store twine. These are all over Pinterest. Helmar makes it easy with Helmar Premium Craft Glue (or Helmar 450 Quick Dry if you have it) and Helmar Liquid Scrap Dots. Begin with Helmar Premium Craft Glue around the top of the mouth of the bottle. Wrap twine over the adhesive and wait till dry and secure prior to moving on. Run a bead of Helmar Liquid Scrap Dots from top to bottom on the front and back of the wine bottle. I chose this adhesive because of it's slow dry time and great adhesion to the glass. Be careful with this step not to smear the beads or to get it all over you. Wrap wine bottle with twine. Nearing the bottle use Helmar Premium Craft Glue once again to finish adhering the twine to the bottom edge of the bottle. Ad some fun embellishments to your twine bottles and create a cluster of varying sizes to have a beautiful centerpiece. Thank you for taking the time to view these projects. Have a happy Helmarific day! Hey there! Liz here today to share a few projects I made using wonderful Helmar glue and embellies from Want 2 Scrap. 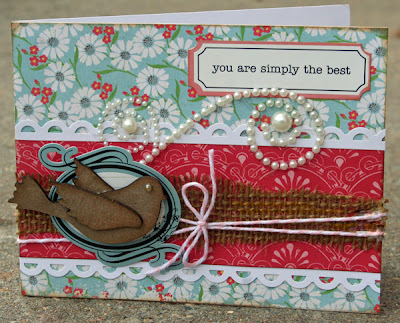 I am so excited Want 2 Scrap is partnering with us again because I truly love their gorgeous embellies and bling. I had a great time gussying up this page about my beautiful daughter. 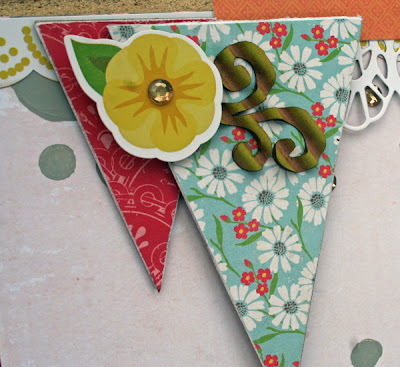 I covered Want 2 Scrap's Nestaboards Nested Pennants with patterned paper and inked a few Corrugated Hand-Drawn Swirls to add plenty of flair to my page. I scattered a few Amber Rhinestones to complete the fun look. 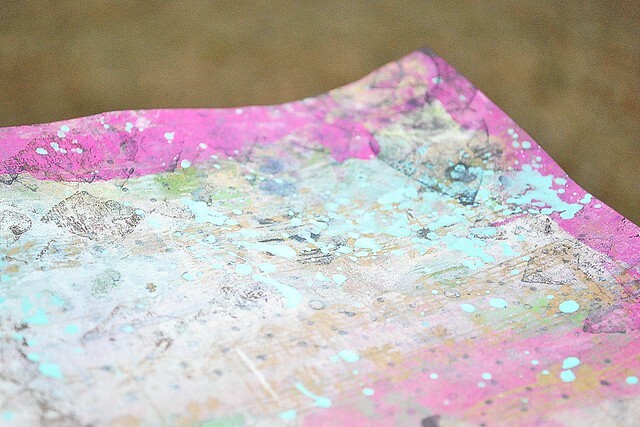 Helmar's Acid Free glue and 1/4 Zapdots were used throughout the page. I arranged and left the Nestaboard Bird undressed but added a simple Amber Rhinestone for his eye. A Maxxi Girl Pearl flourish completes the card. Homeschool Monday: Are "Ewe" Ready? Hi, Lisa back with you today to share another Helmar Homeschool post, as well as introducing a week of inspiration using Helmar and Want2Scrap! They can all work together for todays post... homeschool, Helmar and Want2Scrap! Are "Ewe" ready for Easter? Because this week I am sharing a special homeschool post that could easily be recreated for Easter, as well, or any spring activity. I am going to share a very quick and easy way to use Helmar 450 Quick Dry to create a cute little sheep with your children using supplies you probably already have around your home. A paper sheep template. This can be free hand cut to any shape you like, or you can use a diecutting machine to cut these. You could also use felt. First you will need to put some 450 Quick Dry on the "body" of the sheep. Next, you will wrap the yarn or wool around the template until it is soft and wooly. Just use a little dab of the 450 to secure the wool. Next, using another small dab of 450 Quick Dry add the "eye" pearl. These little pearls actually come with a thin layer of adhesive, but with children's crafts I find that with all the playing and exploring, they needed added adhesive to stay put, so 450 is the perfect solution. It drys fast and secure. We are studying "Warm As Wool" by Scott Russell Sanders so this craft is part of that book study. I will be sharing more about that study, including how to make a covered bride and log cabin replica using craft sticks and more Helmar, so make sure to visit my personal blog at the end of week to learn more. 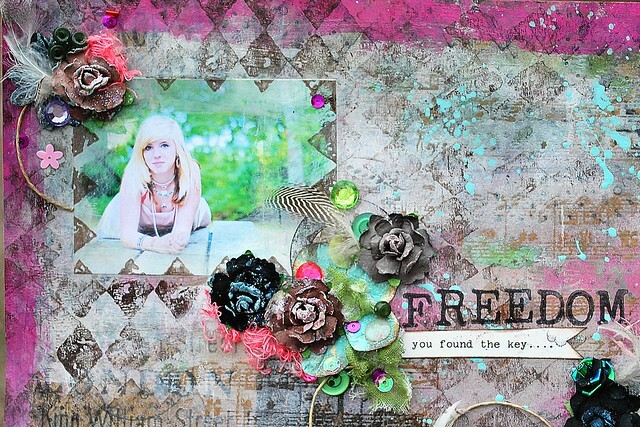 Hello, it's Amy here today, to share a mixed media layout that is extra special to me. My sweet oldest daughter turns 18 on Sunday, and I wanted to celebrate the great things she's done using a piece of my art. My daughter inspires me with her art (she plans to attend art school) on a daily basis. 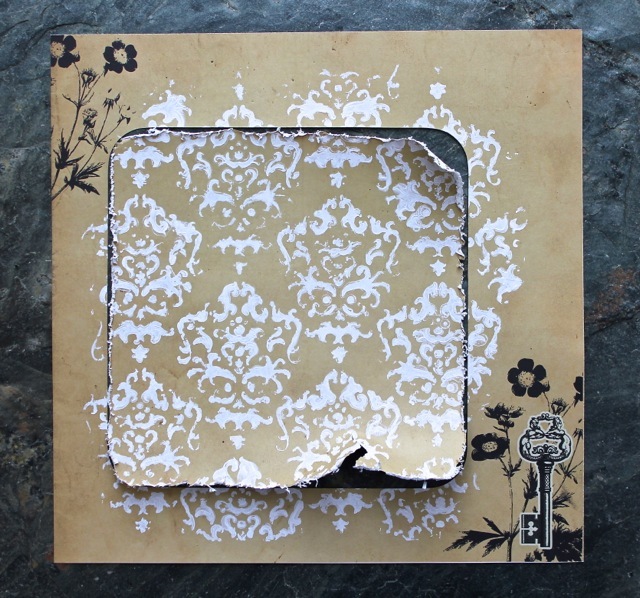 I began by using a Tim Holtz Kraft resist paper, and added several layers of stamping, paint, and inks. I had a wonderful time creating, almost as I would a canvas. I didn't add anything at all, until I completed my background. I note this, because this is out of my "norm" while creating. Next I added this photo of my daughter, and blended it into my background with iridescent paint and water, using my fingers. 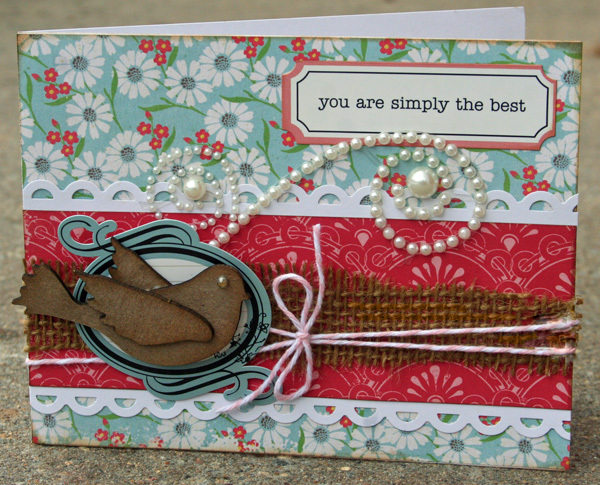 When that dried, I used a harlequin style background stamp, and stamped around the edges with Mix'd Media Inx by Clearsnap. Next it is time for my favorite part in the creation process....embellishing! This is where my Helmar Premium Craft Glue comes in extra handy! All of these twine swirls were made by letting it fall naturally on the page, and then squeezing a bit of the Premium Craft Glue in three points...on the ends, and in the middle of each piece of twine. To add the bits like buttons, sequins, and the "leaves" made from cheesecloth, I always add a squeeze of Helmar Premium Craft Glue (or sometimes 450 Quick Dry, depending on how heavy the object is), by tucking the tip of the applicator on the bottle under the flowers or other large embellishment. It adds a perfect amount of the adhesive, it's never too much. Even delicate objects like feathers adhere just right, without becoming stuck together or overwhelmed by the adhesive....which makes it look natural and free. 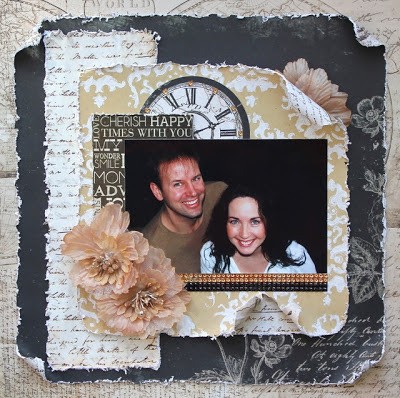 Vicky blogging today with a breakdown of how I created a layout about my husband and I, using the Prima Engraver papers (in my March Swirlydoos "Vintage Chic" kit) and tons of Helmar goodness. I cut one inch off the top and the left side of the black paper - leaving me with an 11-inch square (without cutting off the pretty flower print). I distressed it with my electronic Zutter Distrezz-it-all tool. Then, I cut a 3.5-inch wide by 10-inch tall piece of the script paper and distressed that too and glued it down as shown with the Premium Craft glue. NOTE: I never glue all my edges down so that I can add texture, tears or curl the paper edges later on. Next, I took a Prima stencil and stippled gesso onto the middle of the tan paper (where there was no pattern printed). Then, I cut an 8-inch by 8-inch piece out to use as another layer. TIP: If you choose to use a light colored photo, then black gesso might look better. Since my photo choice was dark, the white makes it stand out better to create the focal point of the page. After adding my gesso patterned paper, (without glueing down the bottom third of this paper), I chose to fussy cut a clock out of one of the other Prima papers and add the Prima flower packaging to frame my photo (photo is standard 4x6 inch size). On the clock, I cut apart some Prima bling strips to accent above the numbers. The papers were glued down using Helmar's Premium craft glue and the photo was added using the Adhesive Runner. To polish things off, I added some Prima bling strips under the photo and tore the gessoed paper up to the bling. I then tucked a scrap of the scrip paper under it the tear. I curled the tear, as well as all 4 of the black paper corners and the top right of the gessoed paper too. Lastly, I took off the bottom layer of one of the Prima flowers and tucked the petals into the top right curl before adding the two large flowers to the corner of my photo. The flowers were added using Helmar 450 quick dry. Here is another project I created, using my Swirlydoos kit, lots of doillies and inspired by the March Prima BAP challenge. I have been itching to scrap this recent school picture of my daughter in her favourite dress. I used the Premium craft glue on the paper layers, the 450 quick dry on the flowers and the adhesive runner for the photo. One Sheet of Paper into One Cute Mini Album! Loving Pink Paislee and Helmar! I created this little video to share the steps for you. I loved how this project was fast and easy to put together with my Premium Craft Glue. I was able to use it on all the papers, photos and embellies without switching glue every few minutes to add something else. You may also notice these sweet mustache flair buttons by The Paper Bakery. I loved added them to this mini album and found that as usual my Scrap Dots gave the perfect lift these little buttons needed. I love how the Liquid Scrap Dots conform to any embellishment I add and I can make them as tall or flat as I wish. Flair often has a slight scoop in on the back and this is a great way to adhere them evenly and securely. We have been having so much fun sharing how our favorite glue can be paired with Pink Paislee this week! On behalf of our design team, I wanted to say a special thank you to Pink Paislee for joining us this week on this Blog Hop. It was a week full of inspiration! I am so thankful to have played with so many beautiful products! Hello Helmar fans! JJ here today, continuing our Pink Paislee with Helmar week. The "Portfolio" collection is hip & trendy and it's perfect for 'everyday' pictures. The 'polaroid' frames are fun, and easy to work with - a little Professional Acid Free glue, and you're good to go. Naturally, I glued all the papers, and die-cut tags with Professional Acid Free glue, and 450 Quick Dry works a treat with wood embellishments. For tiny little embellishments like these wooden stars, I like to grab them with tweezers and dip the back into 450 Quick Dry. It's easier than trying to apply the bottle tip to the embellishment. Good morning! 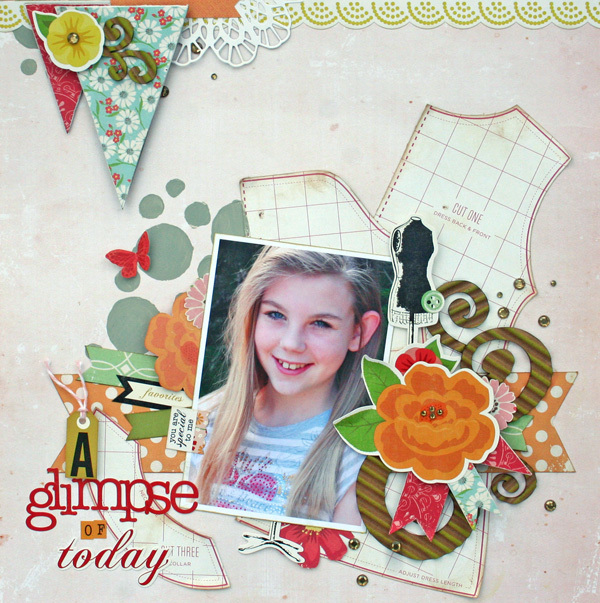 Kate here today, sharing with you some pretty layouts made with Pink Paislee products and Helmar glues. I think that any time of year is perfect for pretty layouts filled with pink, love and hearts. Don't you? "Discover True Beauty" is a layout showcasing a photo of my daughter, Lily, before her dance recital last year. Playing on the pink in her hip-hop costume, I used lots of papers from Pink Paislee's "Secret Crush" line. The papers are happily layered with Helmar Premium Craft Glue. You can see in the inset photo how I added Helmar ZapDots to give a little height to my paper banner and arrow. I like how it gives the illusion of the title moving up off the page. I created "My Love" in last week's Helmar Live Ustream Class. I'll include the video at the bottom of this post so you can see how I created the layout using Helmar, Pink Paislee and Pan Pastel products. Again, I used Helmar Premium Craft Glue for all my paper, Helmar 450 Quick Dry Adhesive to attach the pink ruffled trim, and Helmar ZapDots to give lift to my matted background and photo. I really enjoyed creating with these Pink Paislee products. They are definitely a perfect match for almost any Helmar glue! 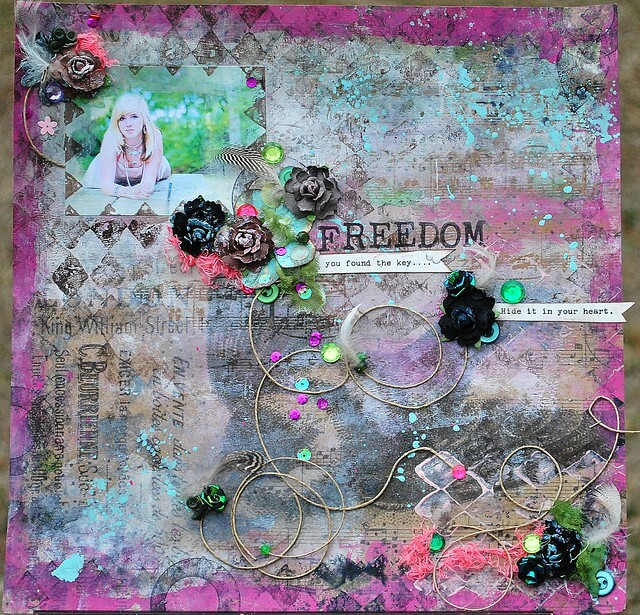 You will want to check back every day this week for more awesome projects by the Helmar Design Team as they partner Helmar glues with more Pink Paislee goodness. Thank you for joining me today!